I don't know what I was thinking when I was working on this little gift. I wanted to make a Halloween gift. I guess I just saw the finished gingerbread boy image and ran with it. I do like how it turned out but it wasn't what I wanted. Anyway, to make this you only need a few things. 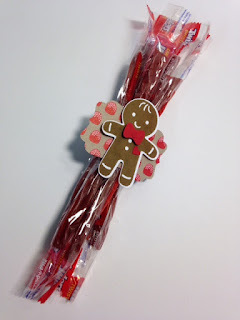 I took 5 pieces of pre-wrapped licorice and "tied" them together with some "Candy Cane" Washi tape. Then I added the decorate paper label. I set the gingerbread boy in place using Dimensionals.